There are many trends to evaluate a resume quickly. The hiring managers seek the resumes that are short and more focused. Whether the candidate is finding a new job or trying to apply for another job or sometimes may try to keep the resume fresh. Here are few steps that will make the resume look professional. Writing a resume will never end until I get its professional look. A correct formatted resume can help one to achieve the targeted job. When the candidate is unwilling to prepare or spend time in resume, it is not so easy to get the desired job. Certain words in the resume will help the hirer to look forward. Here are few steps that will help the candidates to find a job for their resume. Most of the employers may not be well worse in the field that they recruit people. Instead the resume of the candidates will help them to recruit. So vocabulary matters a lot while building the resume. These documents will help the employer to place the candidate in right position. This is possible if and only the employer finds exact words in the resume of the candidate. As the recruiters will be busy in handling many people, the candidate should focus mainly on developing the resume in extraordinary format. Highlighting the qualification summary in the resume is more important. Nowadays the logic is like more precise the resume, easier to obtain a job. Resume should be made simpler as it will save the time of the employer. Remembering the soft skills while writing a resume will help in obtaining a better job. In the resume the soft skills that are to be highlighted are communication skills, positive attitude and even adaptability to working environment. The technical skills such as software skills, exposure to computer and the area of proficiency will clearly add points to the resume. The project management schedules will help in social media platforms too. These are the main things that will help the candidate to find a right job for their resume. The resume should satisfy the recruiter’s expectation. Job seekers should know the keywords that will particularly suit the position. Employers will hire by looking at the keywords that are mentioned in the resume. They also verify the cover letters to find a best candidate. A: Accomplish, achieve, addressed, assisted, acquired, aided, altered, assembled and appraised. E: Exercised, entertained, evaluated, equipped, endorsed, experienced, employed, elected, education, engaged and expertise. P: Pursued, procured, presented, participated, planned, purchase, pioneered, performed. S: Shortened, saved, strategized, supported, suggested, specified, supervised. All the job boards and the companies use a database system to store and manipulate the resumes of the job seekers. These resumes have built in search engines that will help the employers to select the appropriate resumes. Number of years of experience can be mentioned and the related skills and the endorsed skill for the new position. Overall career accomplishment and even the recommendation can be mentioned. This includes the experience that shows the candidate as a professional. Job title, company name, city and the state can be included. It can be one or more. Certain accomplishments that will inspire the next employer can be added. Quantifiable results that will express the skills can also be added. The candidate’s latest degree can be added with aggregate, university and city. This divides the achievements in the body of the letter and the history, where the history will be placed at the end of the document. Here the skills, work history and the achievements can be added. Date, name of the employer also can be added at the bottom of the resume. This tells about the candidate’s talents, unique skills, and his/her versatility and flexibility. It is similar to objective in a resume. Summary can be added as this will help in processing the resume. Here the candidate can mention about the organization, roles and responsibilities etc. This means that the candidate has to add all the data regarding previous jobs. This adds points to the latest degree with aggregate. Here candidates can mention the computer skills to which he/she is exposed. While mentioning certain applications it is good to mention along with their versions as it will leave a good impression on the employer that the candidate is updated. This is best when compared to other types of resumes because it highlights both work history and the relevant skills. It represents the body of the resume as it has many subheadings along with many achievement statements. This means that the professional skills that are related to the previous job experience can be mentioned. These skills and headings can be accomplished in the new postings. Even though the candidate has earned many degrees, the relevant degree that is applicable for the current job has to be highlighted. The relevant career goal has to be mentioned as per the qualification and the requirement. The resume format has to be followed as the jobs have to be listed by the most recent job and the next and so on. This will enable the employer to make it easy for him/her to go through it. Mentioning the name of the candidate will give a piece of information about the person to the hiring manager. The name should be highlighted by making it bold and also making the font size a litter bigger comparatively. Using a regular font style will help one to read it easily. This address line has to be complete as in case if the employer wants to enquire about the candidate personally. If the candidate is seeking for a change of residence then it has to be mentioned. Contact number can be a cell phone number or a work number, but if the employer contacts then the candidate should be ready to answer the phone call. Do not neglect the calls of the interviewer as they may not be free when you are. This has to be added to the heading as the employer may try to contact the candidate via email by sending some attachments. It is a common form of communication between the employer and the job seeker. It is advisable to use personal email id rather than using office email because most of the companies monitor using their databases. If the candidate owns a URL then he/she can attach it in heading. Adding it will be an added advantage to the candidate for seeking jobs in foreign countries. Usually the objective in the resume should be short and must contain targeted statements. Before writing the job objective, candidate has to do long term search about how to write a killer objective. It will be a quick summary of the entire resume. The objective has to be different while applying for different positions. The objective should not be very vague as the employer will feel bored to proceed further. The sentences has to be short, they should not be continuous. The candidate has to mention how he/she can contribute for the growth of company rather than learning from it. It is more noticeable while writing. Example: Engineering candidate: I want to share my knowledge in the field of automobiles and want to implement new ideas that will enhance the growth of the organization. Here the candidates can mention about the years of experience and also the latest degree, personal values that will help to be best fit for the new position, background details, work ethic and also the summary of entire career. Sometimes even the salary can be mentioned if required. The proficiency has to be added along with the qualification. Strong communication skill and the interpersonal skills will add point to the qualification. Professional experience can be differentiated from qualification summary, this will add greatest achievement whereas the professional experience has to be maintained in reverse chronological order. Major academic accomplishments can be added. The internship training can be added. Curriculum development, client service and the group trainings that the candidate has undergone can also be added. Problem solving skills and the situation aroused earlier will be more applicable to get the job. Project management tools and the level of understanding can be included. Work experience can help the employer to understand your roles and responsibilities. This plays a significant role in selecting the right candidate. The applicant must give brief notes that explains the significant benefit for hiring. Listing the companies as well as the work experience will enable the employer to understand the growth in career of the candidate. This information will be acknowledged so it will help in achieving or getting into the new job. Sometimes solid evidences matters a lot. This emphasizes the entire history of the resume. The candidate has to think twice before adding references. Basic information can be added using the cover letter. 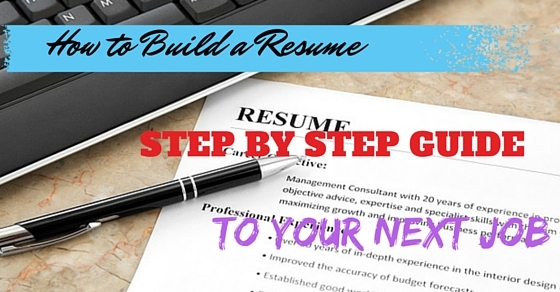 Preparing a resume may be a daunting task but it is important to achieve the good position. The organization that hires the candidates will focus on the well formatted resume. High quality resumes can be prepared by deep understanding of each section in the resume. It gives a real sense of personality by adding skills and experience. Job seekers can also generate their resumes using online modules.